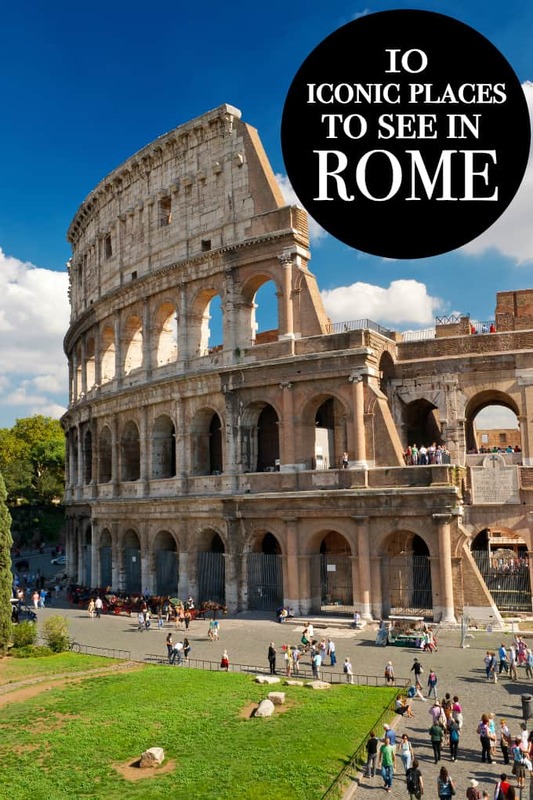 When visiting Rome for the first time, or even the forth or fifth time, the list of things to see seems endless. From castles, to ruins found on almost every street, to fancy Piazzas, and to museums with so much history, not to mention the shopping; it is truly overwhelming. There is always something to see in this nearly 3000 year old city. If you start with these, you will be sure to see some of the main highlights of this ancient city. 1. The Colosseum. Usually first on everyones list, is indeed the Colosseum. Situated in the centre of the city, it is circled by one of the many busy streets in Rome. In all your excitement to get closer to this iconic symbol, make sure to check both ways before crossing the street, then check again, as Romans are always in a hurry and sometimes feel like stopping for people to cross the street, is a waste of time. There are daily tours to go inside and a small museum set up in there as well. Make sure to also take a look at the Arch of Constantine while there, you definitely can’t miss it. 2. Trevi Fountain. One of the largest Baroque fountains in the city, and taking up a large portion of limited space in Rome (86ft high and 161.3ft wide), is one of the most famous fountains in the world. 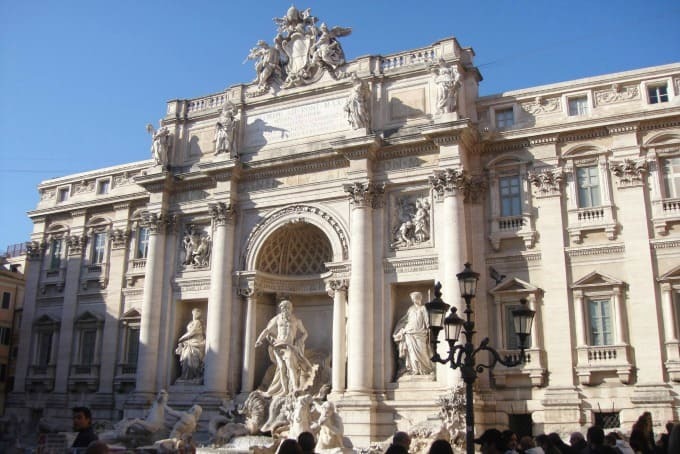 Trevi Fountain is usually always busy, so make sure to keep a firm hold on your wallet and belongings, as pick pockets love to visit areas that are dense with tourists. Bathing or walking in the fountain is strictly prohibited and will be met with a fine from the Carabinieri (Italy’s police). However, throwing coins into the fountain is always a welcome and fun thing to do. Turn your back to the fountain, make a wish, and throw the coin with your right hand over your left shoulder. It is said that this ensures your return to the city, as well. 3. The Spanish Steps. After a long day of wandering around the tiny, twisty streets of Rome, taking a much deserved break on the Spanish Steps is almost a right of passage to anyone visiting, or even living here. Tucked onto the right hand side of the steps, is the old home of John Keats where he lived and died. It has since been turned into a Museum honouring the poet and his work. 4. 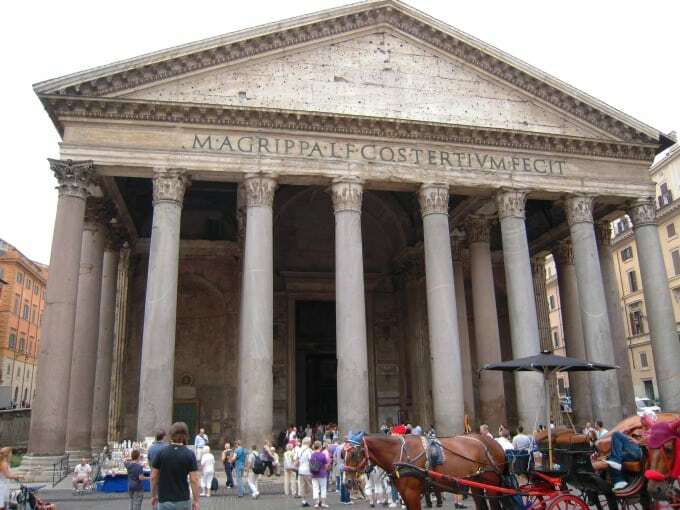 Pantheon. This building, which is my most favourite, is almost 2000 years old and showcases the remarkable architecture from the Roman Empire. It is an open space that can be freely walked into and explored. Often times there is a choir or a sermon be held, that you can quietly observe. The famous artist Raphael’s tomb is inside here, as well as Italian Kings and poets. Outside of the Pantheon is the Fountain of the Pantheon, another common resting area to take a break and gaze upon this amazing wonder in the Eternal City. 5. St. Peter’s Basilica. 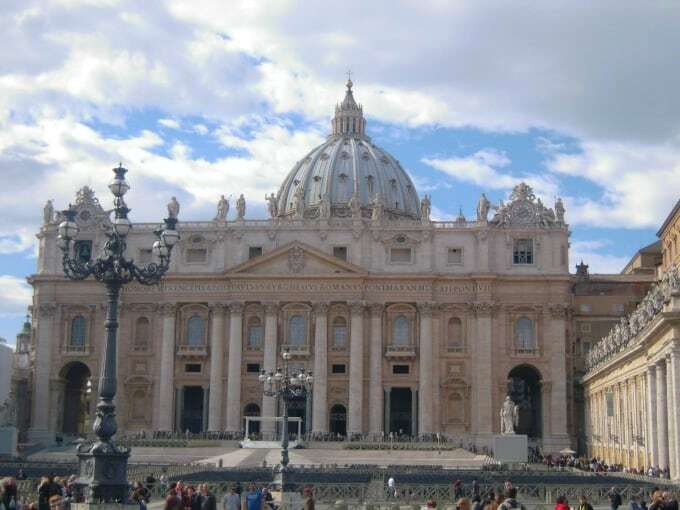 Located in the Vatican, a city within a city, is the papal enclave inside the walls of Rome. You could spend a whole day here, just exploring the Vatican grounds and the Vatican Museums. This is home to the Sistine Chapel and other great masterpieces. Ladies, be prepared to have a wrap or scarf to cover your shoulders (no tank tops allowed) as well as a modest length skirt or shorts, if you are travelling there in the summer. Countless tourists have ben turned away by the guards for not being properly dressed. Even if you are not Catholic, respecting the rules and guidelines for entering these Holy Grounds is a sign of respect. If you are feeling adventurous and are not claustrophobic, a steep trek up to the Dome of St. Peter’s Basilica, should be on your list. You can get a fantastic view of Rome from this angle, and it shows you just how ancient this giant church really is as you push your way through the slim walls of the Dome up to the top. 6. Piazza di Spagna. 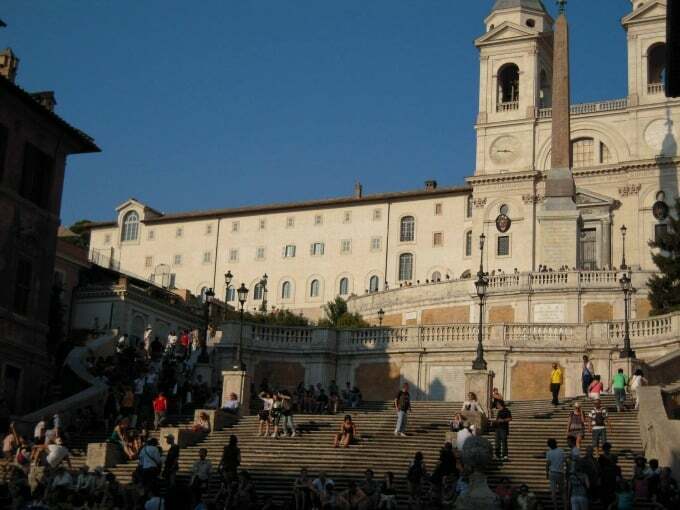 This square is situated at the bottom of the Spanish Steps and is a very short walk away from some of the high end shopping in Rome. Valentino and Gucci are just a couple stores that grace the street in front of Piazza di Spagna. At the base of the steps in Piazza di Spagna is Bernini’s famous Fontana della Barcaccia (Fountain of the Old Boat), which dates back to the early Baroque period. This is yet another unique piece of history to add to the almost endless list of things to see in Rome. 7. Roman Forum. 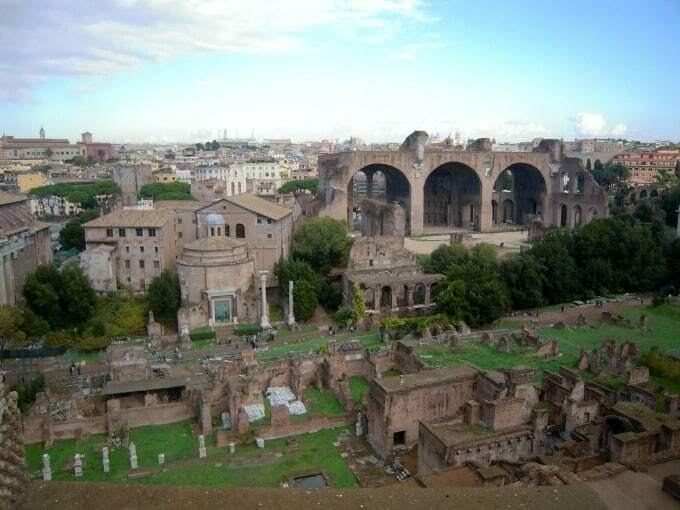 At the centre of Rome and just a short walk from the Colosseum, is the impressive and miraculously intact ruins of the Roman Forum. You could easily spend a few hours in here, wandering around the ruins of what were once ancient government buildings. Make sure to wear good shoes, as the ground can be uneven to walk around. And don’t bother putting your camera away, for every time you turn around, there will be something to catch your eye. 8. Castle St. Angelo. Once the tallest building in Rome, and adorned with a bronze statue of Michael the Archangel (built in 1753) is the Castle of the Holy Angel or Castle St. Angelo. Graced by the Tiber River in front of it’s gates, and the Pons Aelius (the Bridge of Hadrian) this is truly one of Rome’s most historic buildings….but aren’t they all. Originally built to be the mausoleum of the Emperor Hadrian between 134-139AD, it was turned into a military fortress in 401AD, and stripped of many of its contents and history. There are tours you can take of the inside of the Castle, and inside you will find a unique view of St. Peter’s Basilica, that can be seen up the street from the open windows of the Castle. 9. Piazza Navona. This square is probably the most well know of all the squares in Rome. 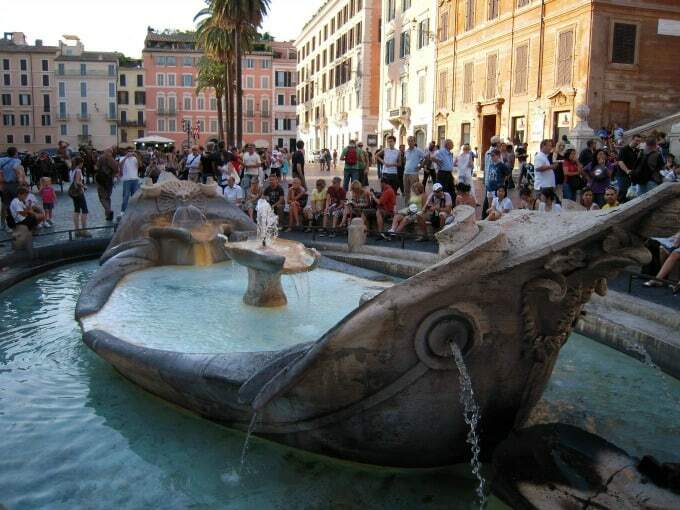 It has been the backdrop of many movies and is home to Bernini’s Fountain of the Four Rivers, as well as the lesser known Fountain of Neptune and the Fontana del Moro. From street vendors and artists hawking their wares, to locals catching a quick break before going back to work, to the endless stream of tourists, Piazza Navona is always busy and never boring. Circled by many restaurants and shops, you could lose yourself for hours, sipping on a cool drink or enjoying some famous gelato and people watching. This is another spot thick with tourists and pickpockets alike, so be sure to keep a hand on those precious belongings of yours as you soak in another great corner of Rome. 10. 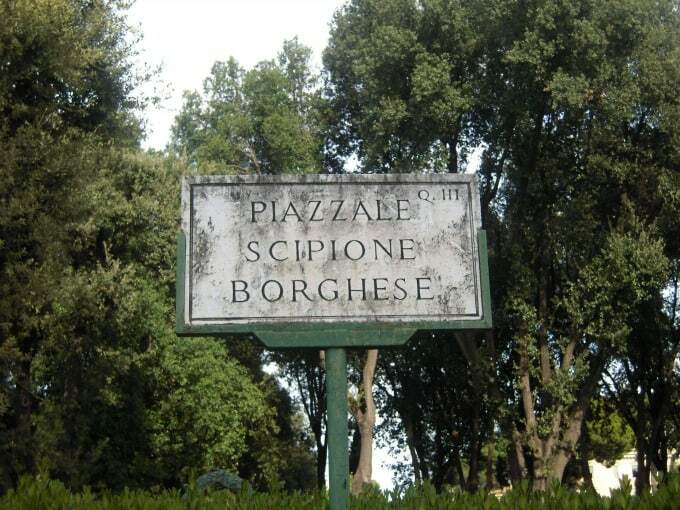 Villa Borghese. Once you’ve got your fill of the hustle and bustle of the more crowed aspects of Rome, now is the time to take a lazy, most likely sun soaked, stroll through the grounds of Villa Borghese. This is Rome’s third largest public park at 197 acres and is a quiet and more relaxed place to spend an afternoon away from the bigger crowds. There are pony rides for the kids and an area to sit and eat. Count on many walking paths with interesting statues and buildings and ruins to explore, as well as the Galleria Borghese art museum, and the Borghese Gardens. Like anywhere in Rome, there are countless things to see and do in this park. After reading this, it may feel like you have stepped back in time. Like you are wandering down the ancient cobbled streets, strolling arm and arm with a dreamy companion, soaking up the culture and the one of a kind vibe of Rome. But I assure you, reading about this ancient city and experiencing it first hand cannot even compare. Seeing, soaking up, and even smelling Rome, is a life changing experience. If you have the chance to see this little corner of the world, take it, and don’t look back. You won’t regret it. I loved the Trevi Fountain – I even have it in LEGO now! I went to Rome on a girls trip with my mother, about 18 years ago. i can still remember the warm breeze as we sat looking at the Trevi Fountain. I would love to go back and see some of the other places. There is just so much to do and see it was impossible to get it all in under one trip. Rome sounds like a great place to visit. I never made it to Rome despite having lived in Europe for many, many years. I always wanted to go but somehow it never came about. That looks like a great list. I’ve been to Florence but didn’t get to Rome. All of these places look amazingly beautiful because I’m a big fan of old architecture. I wish I could visit but since I’m in a wheelchair it would be impossible to get around, so it’s the internet searching for me. Rome would be a trip of a lifetime for me. 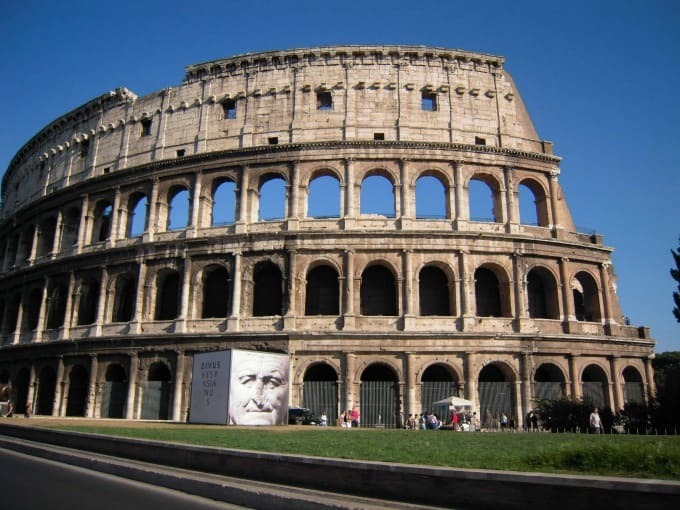 A trip to Italy is definitely at the top of my bucket list and all these sites are on the must see list but the one I most want to visit is the Colosseum. What a beautiful country rich with culture & art. Visiting Italy someday is definietly on my bucket list. So much history in one place! I would love to go there, and take it all in. I would also love to see the Vatican. The pictures are beautiful. What a wonderful article . I was there 12 years ago for my birthday.Many perfect memories of that trip. Rome is so cool! Lots of history. Rome is one of those cities where you always want to go back and explore some more. The history and culture of that city is unparalleled to any other and let’s not get started on their cuisine! Beautiful! Italy is definitely on my short travel list. Thanks for the tips!